Creating an invoice is how to request payment from the retailer for the item(s) shipped. Follow these steps to create an invoice in the Portal. 1. There are two ways to pull up an order that you would like to invoice. 2. 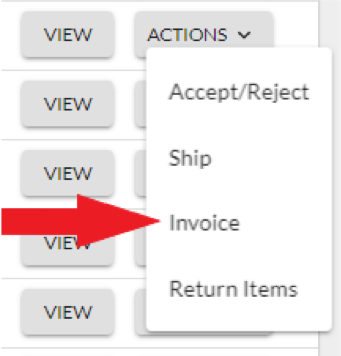 On the Order Management page, click on Actions and select Invoice. NOTE: This is how to invoice an entire order. See further below on how to invoice just the items that have shipped. 3.You will be taken to the Create Invoice page. This is where you will create an invoice for an order. The Billing and Shipping Address information is pre-populated with the information originally submitted on the order. This is not the remit-to address. In the General Information section, you must enter in an Invoice Number. Invoice Date will pre-populate with today's date but can be modified. Invoice Number and Invoice Date are the only two fields that can be modified in this section. In the Invoice Items section, the only field that can be modified is the Unit Price field. In the Invoice Totals section, you can modify Discount, Freight and Tax and the Invoice Total will auto-update based on those changes. Discount will subtract from the Invoice Total, while Freight and Tax will be added to the Invoice Total. 1. Search for the PO in the search box. 2. 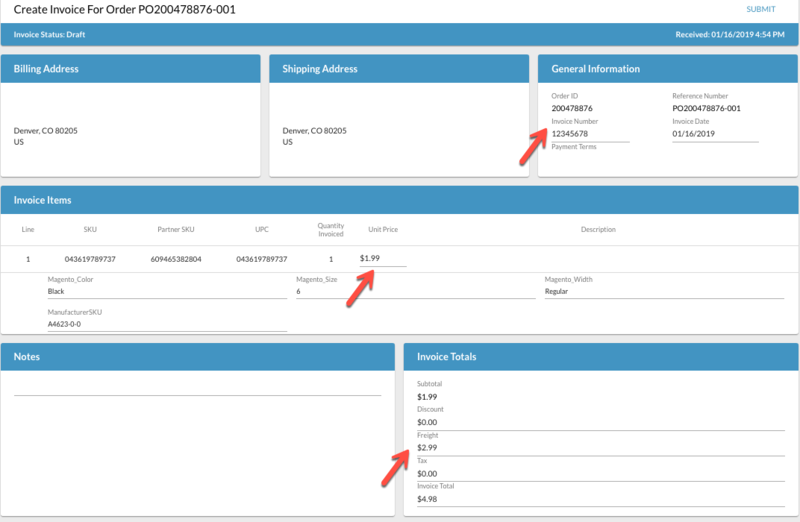 Find the shipment document you want to invoice, click View. Key point: You must view the shipment you want to invoice if you want to limit the invoice to what was shipped. 4. Follow the normal steps to create an invoice and click Submit.